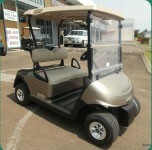 We supply and fit parts and accessories for all major golf cart brands and models, including Club Car, E-Z-GO, Yamaha and Cushman. If we don’t have it in stock in our store or van, we’ll get it. Our batteries last 3 to 5 years if serviced on a regular basis. Please contact us for a quote. Don’t see what you want or need? Visit our showroom or give us a ring. If we don’t have it, we’ll get it.